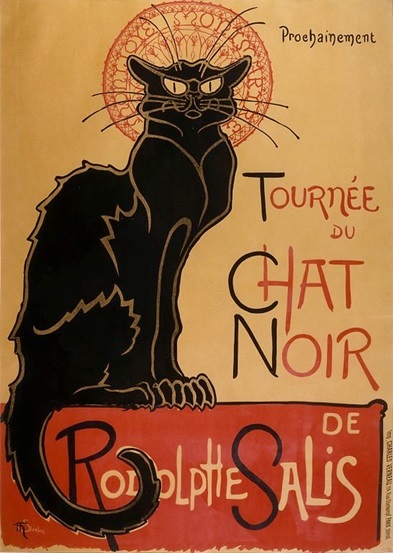 Poster art started appearing in the 1870s, created by some of the then famous French poster artists such as Henri de Toulouse-Lautrec, Théophile Alexandre Steinlen and Jules Chéret. There had been many commercial designs, trademarks and signs that were created and used before their work, but poster art only became a trenchant form during the last part of the 19th century. These hand-drawn posters, signs and inscriptions shared one common history. The art of creating pictorial representations date back to antiquity, when cave dwellers drew on the walls of their stone and rock homes. They drew their victories over beast and birds, their discoveries and their everyday life. In the modern world, the commercial posters were limited to designs purposely created for industry and commerce. Close to the Christian era, the Assyrians, Romans, Greeks, Egyptians and Babylonians have, in one form or another, signs that closely resemble the posters of today. Artifacts found in Greece and Rome showed announcements for slave markets, theatrical performances, public baths, public proclamations, announcement of new laws and contests of gladiators. With the spread of Christianity, posters and signs were used to spread the Gospel far and wide, with the posters depicting them in dramatized images so that even the illiterate were able to learn the Christian teachings. During the Renaissance, commerce and industry were revived and intellectual activities were invigorated. The competition for trade became fierce and merchants started giving out advertising leaflets, displayed signs and posters in busy areas. Pictorial signboards showed inscriptions and trademarks to identify different types of business establishments and merchants. Posters became the first form of visual communication, used for advertising purposes in the 19th century. It became a very handy tool for the promotion of products and services and for recruiting soldiers, spreading ideas to the public and for the promotion of different political parties. In the beginning posters were designed and painted by hand, which put a limit on the quantity that can be produced. Later, hand-cut stencils or woodblocks were used to support the growing demand, which increased when the movable type was discovered sometime around 1440. That was the time when Johann Gutenberg unveiled the process of cutting the letters of the alphabet in small, separate blocks. It made it easier to compose text, and the letters could be re-used, instead of using stencils that had to be thrown away when no longer needed. This was further enhanced when Alois Senefelder discovered the lithographic process in 1796. Through the process, colors could be added to posters without limitation, compared to woodblocks. The novel way of creating raised printing influenced many artists who were still struggling to draw posters by hand. Additional improvements in the printing process freed artists from technical restrictions on range of colors, technique and style. The evolution of the poster printing is quite fascinating. Mural painter and artist Jules Chéret had a brief stay in England to study the lithographic process before returning to France in 1866. He set up show as a poster designer and printer armed with the knowledge he gained from England and good design secrets he gained from Japanese woodblock art or ukiyo-e. 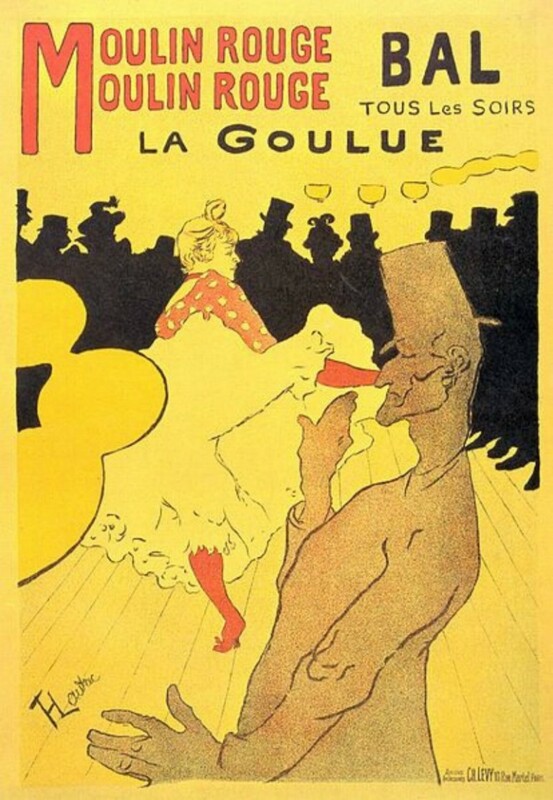 He borrowed the 2D Japanese sense of style and French impressionism for his colors, which perfectly suited the theatrical figures he used for the posters he created for the French cafés and theaters. Toulouse-Lautrec was attracted to the novel art form in 1880 and several artists followed after him, such as Alexandre Steinlen, Adolphe Willette, Eugene Grasset, Alphone Mucha, Pierre Bonnard and George Meunier. The French designers’ works stimulated England’s gloomy poster art, which showed during the 1894 exhibition of the works of William Nicholson, James Pryde, Walter Crane, Dudley Hardy, Will Owne and Aubrey Beardsley. They in turn influenced the poster designers in America, with the work of Audrey Beardsley having a great impact on American artist William Bradley. From the United States, poster art spread to other countries, inspiring artists in Germany, Vienna, Russia and more, each country producing outstanding poster art designers that provided inspiration and greatly influenced the further development of the art form. It even influenced the style of notable mainstream artists such as Picasso, Manet and Monet.